Established in 1981 with a capital investment of Rs. 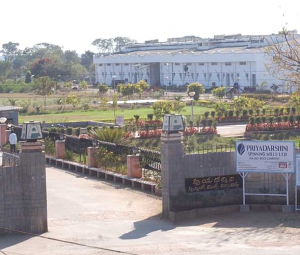 800 lakhs, today Priyadarsini Ltd is a BSE listed Company with manufacturing facilities for yarn and yarn dyeing. The spinning mill has 51,000 spindles where Polyester / Viscose blended yarn is produced for domestic market. The yarn Dying unit dyes Cotton, Viscose, Polyester and its blends and has a rated capacity of 10 tons per day. The 65 acre campus located 70kms from Hyderabad houses both the spinning mill and the yarn dyeing units. Since two and a half decades, Priyadarsini is producing yarn with the focus on product quality and commitment to good customer service. Priyadarsini not only provides a safe, fulfilling, and rewarding work environment for employees, but also serves and supports the society with various social, economic and environmental projects.